We all hear about how important detoxing is for our health and well-being - if you are like me, you get caught up in the daily grind of balancing work life, home life and a social life, that self-care is sometimes put on the back burner, including having a proper skincare routine in place. Having lived in an urban environment my entire life and being exposed to high levels of pollution, I long for days when I get to escape the city for a short while, such as heading to the spa a few hours away in the countryside to breathe in some fresh air (a rare treat for me)! But, there are also many other ways one can detox on the daily, including filling your belly with the good stuff (I follow a plant-based diet and my meals include lots of whole foods such vibrant fruits and leafy greens, starches and beans), drinking lots of water, working out (yoga is a current favourite workout of mine), while also using skincare products that specifically protect the skin against environmental aggressors. 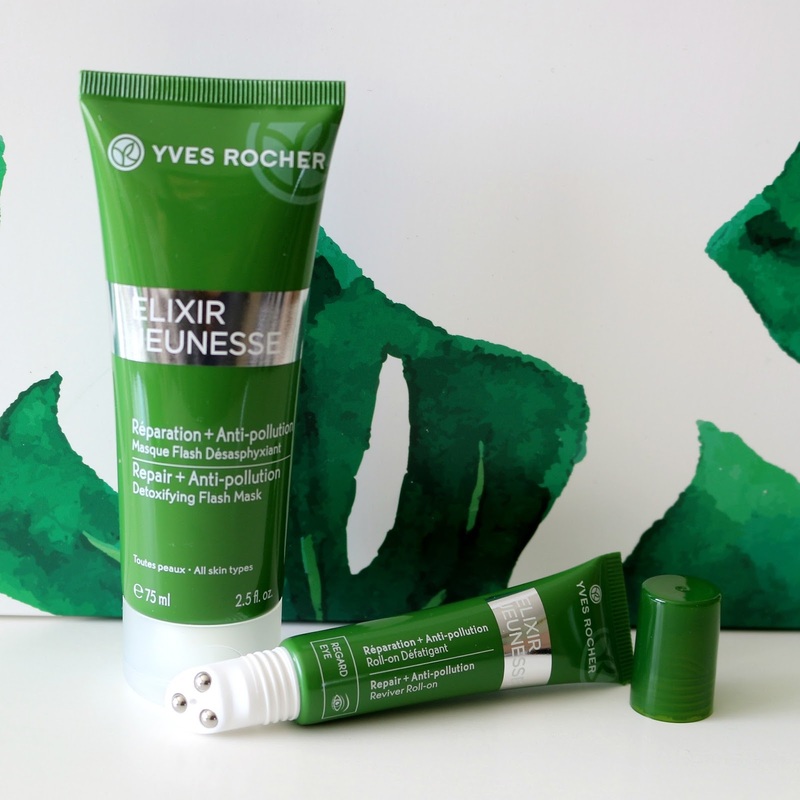 This is where Yves Rocher comes in: they have recently come out with their Elixir Jeunesse skincare line*, starring the key ingredient that is the Aphloia plant extract, a small tree shrub native to Madagascar. The Aphloia plant is known for protecting itself from surrounding harsh environmental elements by renewing its bark entirely as well as concentrating a natural molecule within its leaves. 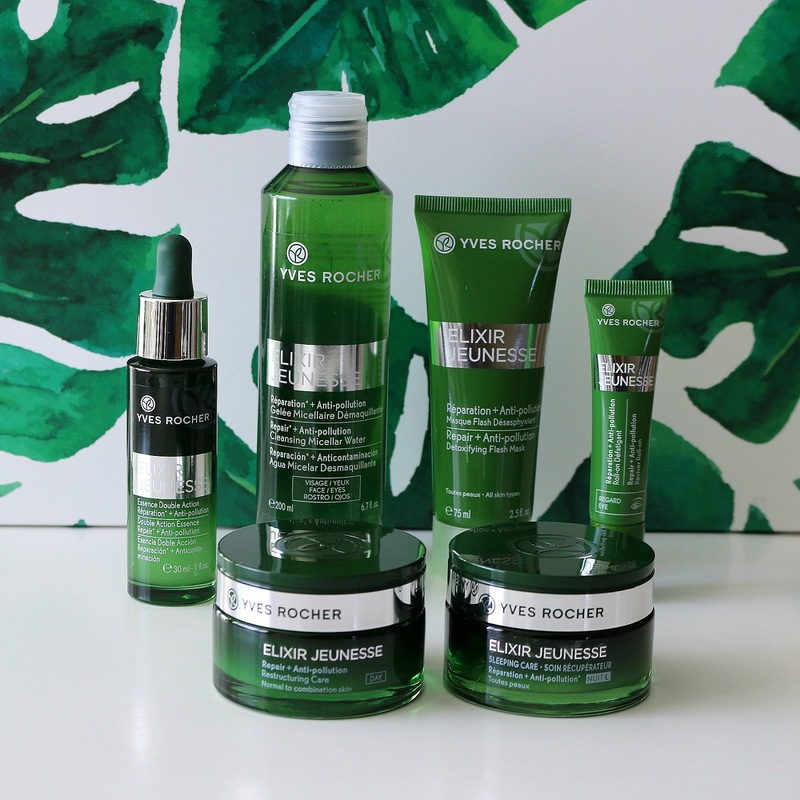 Experts at Yves Rocher were able to extract and highly concentrate this active molecule and develop a skincare line that incorporates this plant's anti-pollution property, with the concentrate acting as a shield on the skin. The harvest of the plant is done in the Moramanga region of Madagascar by women who are offered a fair wage and working conditions and who skillfully pick the leaves off the tree during the rainy season, which promotes leaf renewal. This sustainable practice ensures the preservation of the region's botanical resources. The formulas of the six products that make up the Elixir Jeunesse line are all paraben, silicone and mineral oil free, and made with over 90% natural ingredients and are meant to repair and protect your skin from atmospheric pollutants. They have a light botanical scent which I personally find super fresh and invigorating! 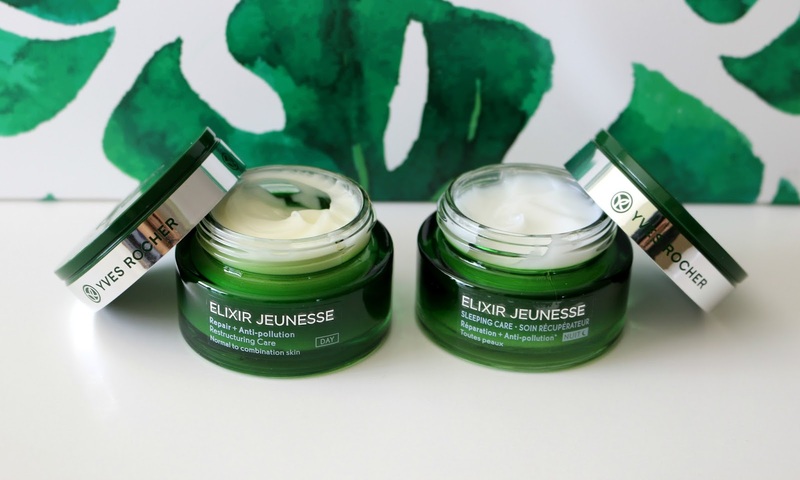 The green and silver packaging is so beautiful too: the glass jars are made from recyclable glass, and plastic bottles are made from 25% recycled plastic. The Repair + Anti-Pollution Cleansing Micellar Water (C$20, 200 mL) is how I've been enjoying starting off my skincare routine in the morning, as well as during evenings on no makeup days (if I have a lot of base makeup, I will reach for a more heavy duty cleanser beforehand). Despite being described as water, I feel it has more of a gel texture, although it doesn't foam or lather like a typical cleanser. To use, I simply soak a cotton pad in the solution and wipe it across my face, making sure to go over my eyes and down my neck. It does a good job at removing light eye makeup too. On top of overconcentrated Aphloia leaf extract, this micellar water also contains aloe vera, which is great for treating inflammation and redness, as well as chamomile floral water which is rich in antioxidants and soothing on the skin. The Double Action Essence (C$62, 30 mL) works to protect the skin against aging accelerators including not only pollution but also stress, UV and fatigue. It has a serum-like texture and is quickly absorbed - as in, my skin literally drinks it right up! It comes in a dropper bottle, and all you need is just a few drops in the palm of your hand. I apply the essence on my clean face morning and night before moisturizing, starting at the center, and then moving my way outwards. My skin feels super hydrated right after and looks visibly brighter as well, and what I especially love is that it does not leave my skin feeling sticky or greasy. Apart from aloe vera and chamomile floral water, this essence also contains citric acid, an AHA which lightly exfoliates the skin and promotes faster skin cell turnover. The Detoxifying Flash Mask (C$39, 75 mL) is not the typical facial mask that you need to rinse off - instead, you are meant to apply a thick layer all over your skin, let it sink in, and once you hit the five to ten minute mark, you remove any excess with a cotton pad. I've been using it twice a week at bedtime and don't even need to follow up with a night cream! I love how it makes my skin feel right after, non-sticky and super smooth, and I notice that my skin looks plumper the following morning too! Other notable ingredients include aloe vera, tapioca starch, moringa seed extract and vitamin E.
The Reviver Roll-On For Eyes (C$46, 15mL) is probably my favourite of the bunch. First off, the applicator is such a treat to use: it features three metallic balls that glide on and evenly distribute the gel on the contour of the eyes. You can even pop it in the fridge for the ultimate cooling effect - perfect in the summer months or after a short night's sleep - the cooling sensation also lasts about ten minutes! Use it in the morning to make you look more awake or apply it at night to re-energize your under eyes by lightly patting the product into the skin. Ingredients worth mentioning in this formula include aloe vera, sesame seed oil, chamomile floral water, mica (which provides the complexion with a beautiful glow) as well as rutin, an antioxidant enzyme which helps reduce the appearance of dark under eye circle and improves the skin's elasticity. The Restructuring Day Care (C$60, 50 mL) is a gel-cream daytime moisturizer that feels very light on the skin. I use it right after applying the Double Action Essence to lock in the moisture throughout the day. Within a couple of minutes, it completely sinks into the skin and leaves it looking matte, so you can quickly follow up with base makeup. It comes in a recyclable glass jar, which gives a nice weight to it as well as a luxurious feel. The scent is super uplifting and is the perfect pick me up when getting ready in the morning! Again, this product contains aloe vera and chamomile floral water, as well as shea butter and vitamin E.
Lastly, Sleeping Care (C$60, 50 mL) is (you guessed it!) a night time moisturizer, but what I love so much about it is that it does not have that thick, creamy texture that takes forever to sink in. Instead, it has a gel-like consistency and does not leave your face feeling sticky or oily. Again, I layer it on top of the Double Action Essence to boost hydration, avoiding the eye area. When I wake up, my skin has a nice glow to it and looks nice, plump and healthy! I personally prefer lighter products before bedtime, and this product ticks all the boxes. Apart from calming aloe vera leaf juice and chamomile floral water, this moisturizer also contains macadamia seed oil and vitamin E.
I've been using the complete Yves Rocher Elixir Jeunesse skincare line for the last couple of weeks and I love how it has restored my skin to its natural radiance! I am in my mid-twenties and have yet to have wrinkles or deep fine lines, but with continual use, tests have shown that you can expect to see your lines reduced. I am all about having a proper skincare routine in place to reduce the appearance of the first signs of aging and using the products from this line, which specifically target detoxifying the skin from external aggressors as well as combatting the effects of stress and fatigue on the skin, has been a positive experience for me thus far. Bottom line: this skincare line is definitely worth checking out! What product would you most like to try? *Disclaimer: This post was sponsored by Yves Rocher. Some affiliate links provided. Been needing and wanting to get a good face mask to apply. This is just what I am looking for. Have to take care of ourselves and our skin as well. 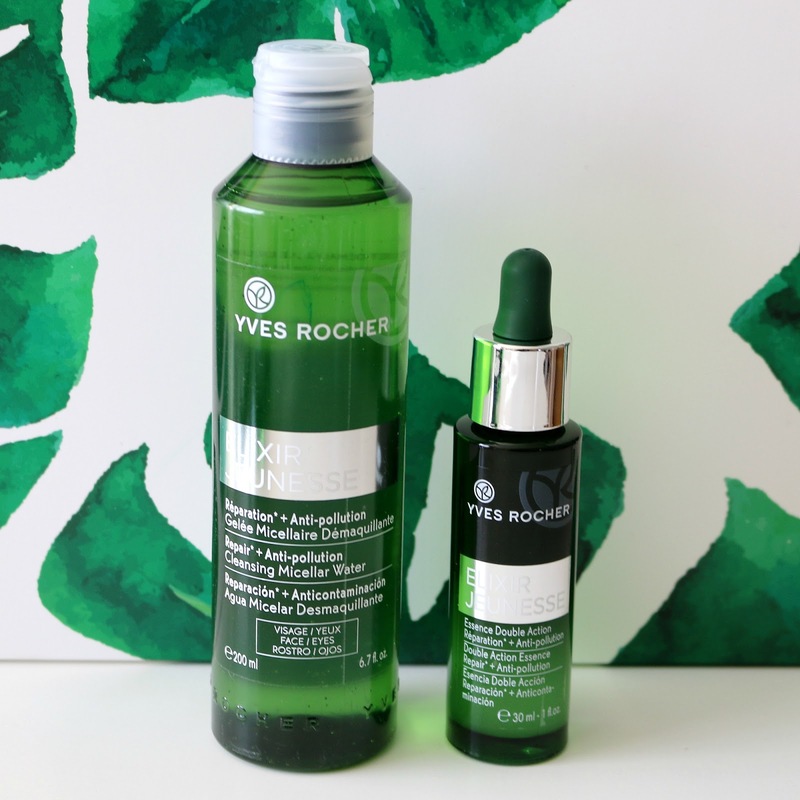 I have been using Yves Rocher products for years. I have always been really happy with them! I can't wait to try these ones out! This line seems amazing! I have been wanting to check out some new skin care products, and I think these would be wonderful! Ooo this all sounds incredible! I would love that eye one as well. I get terrible dark circles and I hate them, so I'm always looking for stuff to help with that. I have never heard of this brand before, but everything sounds fantastic! I actually don't mind the price point either. Wow - I’m intrigued! Especially for the Double Action Essence. And the Reviver Eye Roll On! This is the first time I have seen an eye cream with a roll on applicator. I think that will work very well. My eyes are always puffy which makes me look tired all the time. Well, I actually am, but still, I don't want it to show on my face. I would love to try this Reviver Roll On for Eyes! I need to try out more products, I've heard great things from this brand and I think I should just try them out. I am always looking for new great products for my skin. I am going to have to try these out for sure! I was just looking at my skin the other day and thinking to myself...it is time to stick to a skin regimine. I am going to look into these products some more. I've never tried this brand. I haven't used Yves Rocher products in years. They were the 1st subscription cosmetics box I ever remember. Their products were a favorite of my mom's. I bet she'd love to check out these new products. I need to check this stuff out. I love the no pollution idea! I have tried this stuff before and I love it! I use the mask all the time. I was recently in the store looking for a particular eye cream that I use, and as I was browsing the shelves, I noted a lot of detoxifying skincare products. I had no idea how important it was! 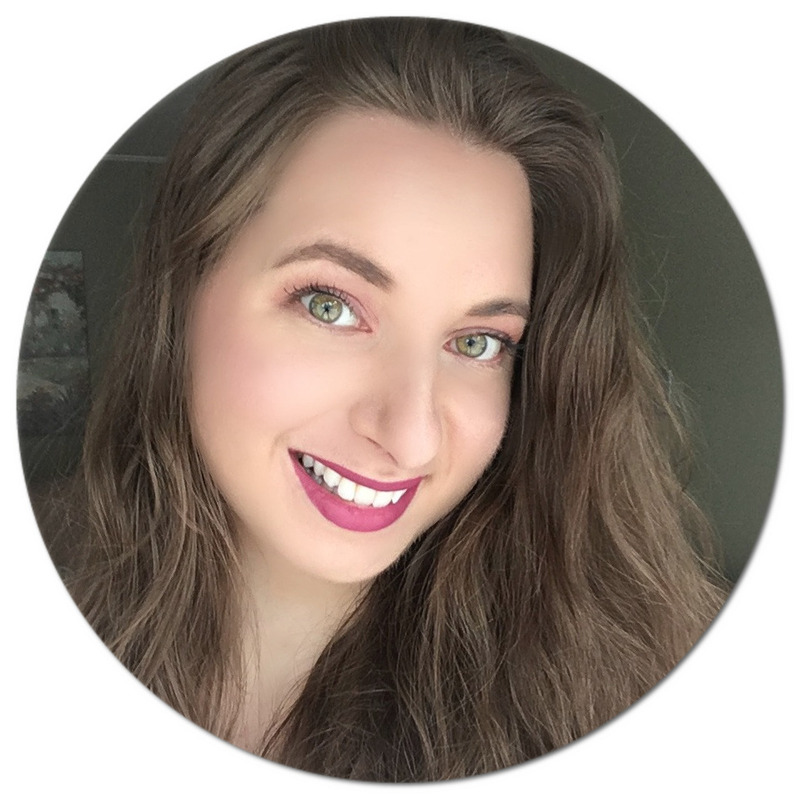 I love learning about new brands from friendly bloggers! Can I ask about that awesome backdrop of palm (?) leaves - too cute! I've heard so much about Yves Rocher and I think it's about time that I tried it for myself. The cleansing water is something that I could use everyday. There's so much to love about this line! I heard of this brand but I never knew they made skincare. This sounds like a wonderful line. I would love to give it a try!! My skincare routine is extremely basic. These sound like great products. Maybe I need to try something new. This looks like a great skincare line! Living in a big city, I really need something that's anti-pollution. I've never heard of these products. I would love to try them. They sound amazing! I've never tried this one before but I sure wouldn't mind. It sounds like the perfect line of skin care products to help take good care of your skin. I have extra dry skin especially this season and I'd love to try this line just! I'm pretty sure it's going to help make my skin hydrated! I've been hearing so much about this one and I think it's worth checking out! There's nothing like finding a product line that will improve the quality of your skin! I really need to start taking better care of my skin. I'm not getting any younger, and have been stuck in the same routine for years. I've been looking for a new skin care line, this one seems exactly what I need! Thank you so much for sharing it! Now this sounds like an amazing range of products, I wouldn't mind trying them all but the Reviver Roll-On For Eyes in particular looks so reviving. I have a great deal about Yves but never tried its products. These look some promising reviews. I will definitely check these out on my next shopping trip. All of these products sound amazing! I would love to try that Sleeping Care out. I'm in need of a new moisturizer. All of these products sound great! I'll have to check them out for myself. I haven't tried any product from Yves Rocher. I like how their packaging is so simple. These look amazing! I haven't tried things from this brand. Thanks for sharing. I don't know much about the skin products, but my main concern is that my face is clean and not dry afterwards. How do these products fit against competitors? Haven't used this products and now I want to. I’ll be looking for them soon.